I have loved roasted eggplant since I was a wee child. Both my grandmothers cooked eggplant over earthen or clay stoves with wood fires. The smoky, luscious eggplant was dressed with cilantro, green chilies and mustard oil. My maternal grandmother may have added sautéed onions and a few spices on occasion. Roasted eggplant is beloved by many culinary traditions. Middle eastern dishes like babaganouj and Persian spiced eggplant are some of my favorites. The mediterranean and the near and far East have their own versions. I've described the simple method favored in Bengal. In other parts of India, tomatoes, spices and garlic are added with amazing results and complex tastes. I demonstrated this dish at the farmers' market a few summer ago. I don't usually cook it at home as my husband doesn't prefer (his code for 'I really don't like') eggplant. He's tried it and just doesn't like it. I've always wondered if he'd feel differently if we called it aubergine, which is far more sophisticated and appealing. Last weekend, I was in line a produce vendor at the farmer' market and the two women in front of me were talking about eggplant. One said it looked great, but she didn't know what to do with it. So I offered up this technique in which you can take the flavor profile into any direction that you prefer. The roasting takes a little time and can be a bit messy if done over a gas flame (lining your stove with foil may help), but it can also be done in a broiler with the eggplants cut in half and laid with the cut side down so the outsides char. The smoky, umami liquid that pools when you allow the eggplant to cool in a bowl is too delicious to toss; strain it into the pulp. Waste not want not. I have dressed this with parsley, mother of thyme (a little less intense than regular thyme), gray salt, lemon and olive oil. I added a teaspoon of mustard oil in honor of my grandmothers--the pungent flavor blends perfectly with the smoky sweetness of the eggplant. You can add other herbs, garlic, onion, spice mixes including zatar, ras el hanout, herbs de Provence, garam masala, cumin, Thai curry paste, Chinese five spice, miso, tahini or something from wherever your imagination and inspiration lead you. Large, globe eggplants work best here. Medium rounded eggplants will also do. One large black beauty eggplant yields about a cup of flesh. You can roast an army of eggplants, or treat this like the precious, special dish that it is. Eat less; savor the flavors and the moment. In terms of nutrition, eggplants are a rich,low calorie source of fiber, providing vitamins C, B6, niacin, Folate and also minerals such as potassium and magnesium. You should really try this dish. Who knows. You may make an aubergine lover of someone. Roast the eggplants until the skin is charred all over and the flesh is very soft. Use spoons or knives to break down the flesh. Add all remaining ingredients and mix well. One of the many joys of seasonal cooking is embracing doing the best with what you’ve got. Such is my journey with purple cabbage. I don’t give it much thought at all. I look at it and immediately think cole slaw. But Sarment, one of the farmers I visit every week knowing everything he grows is delicious, had several adorable little purple cabbages a few weeks ago. He also had gorgeous Swiss chard and the usual divine sweet potatoes. These items came home with me and became the inspiration for this dish. I have been making this regularly and eating it with a side of Greek yogurt as lunch. It’s lovely to look at, and the purple cabbage retains its color and crunch to balance against the gently wilted chard and creamy sweet potatoes. Everyone, especially children, are always interested in this dish. It’s appealing. I have used an Indian spice mix here as it is round in taste, flavorful, mild and compliments the vegetables. It’s a particularly good complement to cabbage. 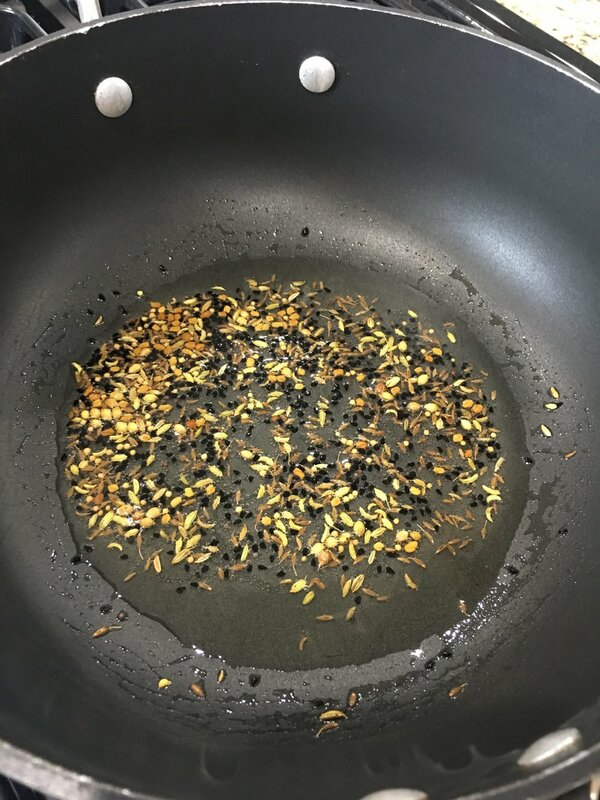 Traditionally used in the Indian state of Bengal, panch (five) phoran (whole spice) is a mix containing fennel, nigella(onion seeds), mustard, fenugreek and cumin. It is used in a old vegetable dish popular in Bengali households called chachori, where no part of any vegetable is wasted. This tradition is being slowly lost in favor of more sophisticated foods, but it’s too delicious not to rescue. You can also use coriander in place of the cumin. You can make your own (equal parts of each) or buy it online. Spices have medicinal and health properties that have been studied in Ayurvedic medicine for centuries. This blend contains spices that act as anti-oxidants and are believed to reduce inflammation. Something this beautiful, easy and delicious makes cooking a delight. Serve it as a side dish, eat with a piece of bread, a small bowl of rice, or with yogurt (like me). I hope you will enjoy it as much as I do. Heat spices in the pan slowly with oil until the mustard seeds just start to pop. Add the sweet potatoes and remaining spices and sauté for 2-3 minutes, covering occasionally. Add the cabbage, toss, and cook covered for 3-4 minutes. Add chard stems and cook covered 3-4 minutes. Add the chard leaves and toss to gently wilt. Adjust seasonings and enjoy. Serves 4.